I just love Half Square Triangle blocks. It only takes two fabrics and there seems to be an endless variety of ways they can be combined. The quilts I want to share with you today are made in EQ8. I haven’t made all of them with fabric yet, but I hope they go from drawing board to quilts soon. The first one is the most basic of quilts using only one HST block repeated 5 times across and 7 times down using 35 blocks. If these are 2” blocks with a 2.5” border your quilt will finish at 15” x 19”. But if you make 8” blocks with a 10” border your quilt will be 60” x 76”. I guess size matters! The next quilt is one of my favorites. It is called an HST Pillar Wrap and it is made entirely of HSTs. For this one I made 3” blocks with a 1” border and it finished at 11” x 26”. Again, you can make the HST any size you want depending on what size you want when you are finished. I also chose to use a third color to set off the pillar design. 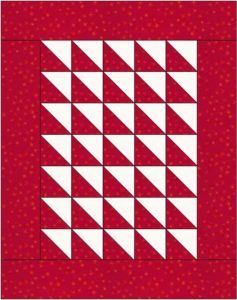 What could be more fun than making 100 HSTs? With this arrangement it is simply HST – Way Out! It can be done scrappy or just in two colors and look stunning. 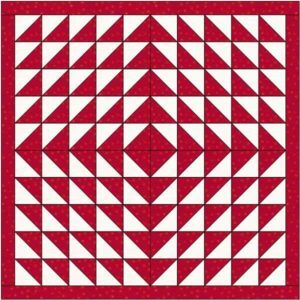 The next one I want to share is 140 HST combined into pinwheels using 4 blocks per pinwheel. 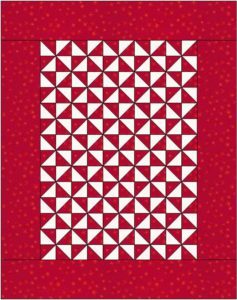 This one can also be made sewing 14 rows with 10 HST per row or making them into pinwheels and only sewing 7 rows with 4 HST per pinwheel. This is another one that can be made large enough for your queen size bed if you use 8” HST or it can make an adorable doll quilt if each HST is 1”. 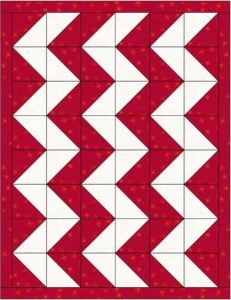 The last one I want to share is assembled in such a way as to make the quilt top look like it is chevrons draping from top to bottom. It is also made up of just HST. I hope I have inspired you to make a stack of HST and have fun playing with them, twisting and turning them until you come up with a design that is pleasing to you. Have fun!